In a unique partnership with Tide + Downy, NFI announces the #DadsWay Twitter Party! Let's get together and discuss how “dad’s way” of doing things—being a more engaged parent, household purchases, household chores (including laundry)—have changed among modern dads. 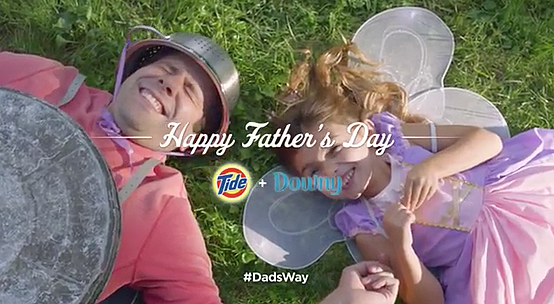 For every tweet using #DadsWay @Tide & @Downy will donate $1 to @TheFatherFactor . RSVP by commenting with your Twitter URL (http://twitter.com/username) over at dadarocks.com. An RSVP is not required to participate or to be entered to win. For over 60 years, Tide has been caring for the clothes of American families and helping to provide the everyday miracle of clean clothing. To meet consumers’ diverse laundry needs, Tide offers its cleaning in a variety of products including Tide Total Care, Tide with Febreze Freshness, Tide Coldwater, Tide with a Touch of Downy, Tide with Bleach Alternative, Tide Stain Release, Tide High Efficiency and 2X Ultra Tide Liquid. For consumers’ on-the-go stain removal needs, Tide to Go helps remove fresh food and drink stains on the spot. Visit www.tide.com for helpful product information, practical tips on laundry care, special offers and promotions and more. You can become a fan on Facebook at www.facebook.com/Tide. Can't see the video? Visit here. This post is a part of the Tide + Downy #dadsway promotion.